Honestly, I don’t watch the prime time news on TV or read local newspapers. Because most of the time, instead of just being updated, I get angry, frustrated, disappointed, and amused by most of the happenings in the country. I feel very sad when natural calamities happen and I get really angry when I hear news about political scandals that involve the country’s coffers. Instead, I read news from foreign lands. At least that way, I am just updated but detached–after all, these are happenings from far away. 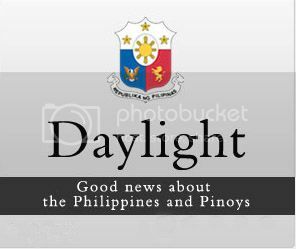 That is why, I am happy to learn that the Philippine government is now active with social media and they are releasing news updates about government initiatives in the online publication called Daylight newsletter. At least, we get to know about what our elected officials are doing and the programs that they have formulated and implemented for the betterment of our country. The good news that the Daylight newsletter brings make me hopeful for the future of my children. As you know, I now have two kids and as any parent desires, I want them to have a secure future under a stable government. Information is a key thing in the development of this country. We also need transparency amongst our government officials. That is relevant to good governance. And if we are informed, we as citizens have the responsibility to react by helping our leaders implement these good programs and to give them feedback if something is not right. This is how the words of former American President John F. Kennedy resound in our modern-day world when he said, “My fellow Americans, ask not what your country can do for you, ask what you can do for your country.” Even though we are not Americans, this is already a wealth of inspiration and encouragement for us. If we know what is going on, then we know how to help. Yes this is good news. I think transparency can be a good help and this means all information can be deliver in time. Oh this is a very good news to all the Filipino people. This is the change we are long been waiting for that our government officials should be taking in action. 🙂 Hope they keep this things and really maintain it just like officials saying powerful words during their campaign period but not even being true with their words and all.